We have been building an increasing amount of Custom Elements, or Web Components, over at the Firefox Marketplace (using a polyfill). Custom Elements are a W3C specification that allow you to define your own HTML elements. Using Custom Elements, rather than arbitrary JS, encourages modularity and testability, with portability and reusability being the enticer. Over the last several months, I worked on revamping the UI for the Firefox Marketplace. 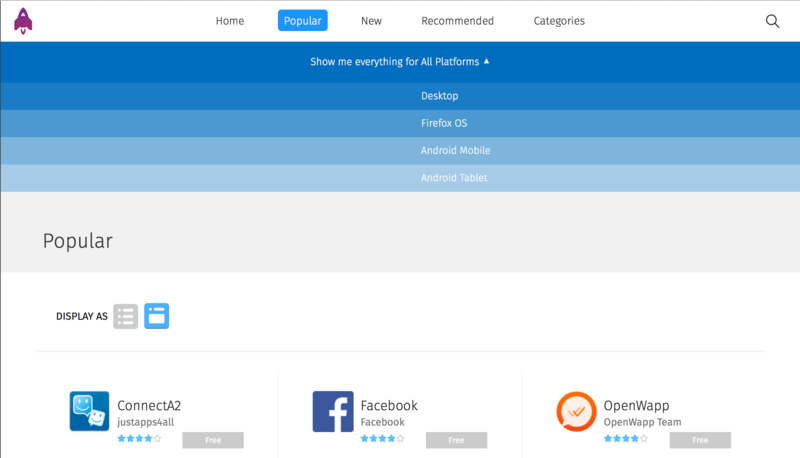 Part of it was building a custom dropdown element that would allow users to filter apps based on platform compatibility. I wanted it to behave exactly like a <select> element, complete with its interface, but with the full license to style it however I needed. In this post, I’ll go over Custom Elements, introduce an interesting “proxy” pattern to extend native elements, and then compare Custom Elements with the currently reigning Component king, React. Custom Elements are still in working draft, but there is a nice document.registerElement polyfill. Here is an extremely simple Custom Element that simple wraps a div and defines some interface on the element’s prototype. // Called after the component is "mounted" onto the DOM. Now we got a gist of what a Custom Element is, let’s see how we can use it to create a custom dropdown by extending the native <select> element. // Actual <select> element to proxy to, steal its interface. // Value set in the createdCallback. This will allow our custom element to absorb the functionality of the native select element. All we have to do is implement the entire interface of the select element by routing to the internal select element. proxyInterface will “route” the property lookups (the first array), and method calls (the second array) from the custom select element to the internal select element. Then all we need to do is make sure our select element’s value is up-to-date while we interact with our custom select element, then we can do things like customSelectElement.selectedIndex or customSelectElement.checkValidity() without manually implementing the interface. Note we could have simply looped over HTMLSelectElement.prototype rather than manually entering in each property and method name, but unfortunately that doesn’t play well with some older browsers. With all of this, we have a custom select element that is fully stylizable while having all the functionality of a native select element (because it extends it!). I love React and am using it for a couple of projects. How does Custom Elements compare to it? Custom Elements has no answer to React’s JSX template/syntax. In most of our Custom Elements, we have to manually shuffle things around using the native DOM API. JSX is much, much easier. Custom Elements has no data-binding or automatic DOM updates whenever data updates. It’s all imperative with Custom Elements, you have to listen for changes and manually update the DOM. React is, well, reactive. Whenever a component’s state, so does its representation in the DOM. Custom Elements is a bit harder to nest components than React. In React, it’s natural for a component to render a component that renders a component that renders other components. With Custom Elements, it’s a bit difficult to connect components together in a nice heirarchy, and the only communication you get is through Events. Custom Elements, however, is smaller in KB. React is about 26KB after min+gzip whereas a Custom Elements polyfill is maybe a few KB. Though the 26KB might be worth it since you’ll end up writing less code, and you get the performance of virtual DOM diffing. Custom Elements has no answer to React Native. They’re both just as portable, they both can be dropped into any framework. They both have similar interfaces as well in creating components. Although, React is more powerful. In React, I really enjoy keeping data compartmentalized in states and passing down data as props. Loose comparison, but it’s like combining the data-binding and template power of Angular with the ideas of Custom Elements. However, it doesn’t have to be one or the other either. Why not both? React can wrap Custom Elements if you want it to. As always, choose the best tools for the job.